Ever wondered what you would do with that heirloom wood from Grandad's barn? 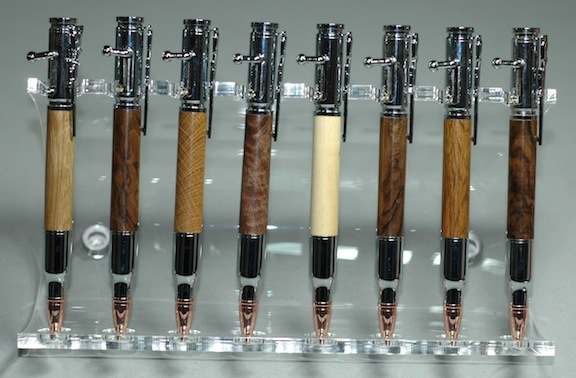 Wouldn't it be cool to have a bolt action pen made from the same wood as your gunstock? How about a functional and interesting gift that has special meaning? I can turn your wood into a functioning bolt action pen like these shown, from your wood, or scrap from your custom gunstock for 50.00. As you can imagine I generate a lot of scrap in the process of making gunstocks. I really like to see the high grade pieces go to good use. have a few made up to sell separately. I also make them out of the local New Mexico woods such as Juniper, Pinon, and Oak. These use a standard Parker type refill, and the construction is pretty robust for a pen. The bolt functions to extend or retract the ballpoint, and these make an outstanding gift. Give me a call or email if you have any questions or would like to order.